Paul Regish of East Hartford, Conn., holds signs as gun rights advocates enter the legislative office building at the Capitol in Hartford, Conn., on April 3. Connecticut lawmakers passed a bipartisan package of gun laws that will expand the state’s existing assault weapons ban, impose limits on the size of magazines, and require universal background checks in the state scarred by one of the worst school shootings in American history. The state's House voted 105-44 in favor of the bill early Thursday. Democratic Gov. Dannel P. Malloy has said that he will sign the legislation into law. State Sen. John McKinney, a Republican who represents the district where the Sandy Hook Elementary school massacre took place, said the bill was far from perfect but a necessary step to ensure the safety of the citizens of the state. Moments before the state's Senate bill passed by a vote of 26-10 on Wednesday, McKinney praised the state legislature for coming together in a bispartisan way, a model, he said, for the rest of the country. "The message we can send if those outside the walls of Connecticut are listening is encourage them to do the same, encourage our elected officials in Washington to put aside the politics and see if they can find some common ground," he said. Senate President Pro Tempore Donald Williams, a Democrat, opened the debate with a remembrance of the victims of the Dec. 14 Sandy Hook shooting. Adam Lanza fired off 154 bullets in less than five minutes after entering the school in Newtown with a Bushmaster .223 rifle and several 30-round magazines, investigators have said. The package put together in Connecticut should serve as an example for national lawmakers, Williams said on Monday. Supporters of stricter gun controls applauded the bill even before it went to a vote. Dozens of protesters who oppose new gun laws were gathered at the Capitol building in Hartford on Wednesday. “I’m prepared to contribute maybe to a class-action lawsuit, follow this up through the legal system,” gun owner Joe Winslow told NBC Connecticut. “I want legislators to pass laws that will protect people while not violating the constitutional rights of law-abiding citizens,” said Joel Klusek, another anti-gun control protester. 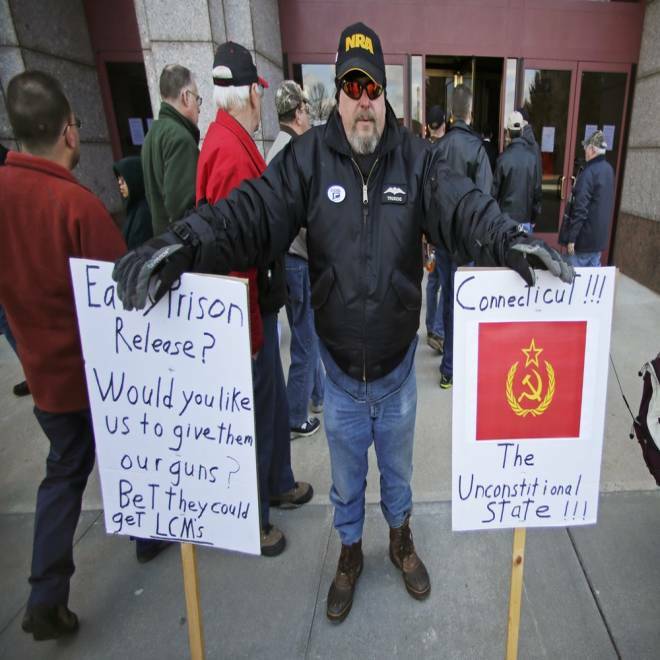 A post on the blog of the Connecticut Citizens Defense League, a group that opposes gun control, said that buses would transport protesters from the parking lot of a Cabela’s sporting goods store in East Hartford to the Capitol and back on Wednesday. “CCDL wishes to thank the NRA for running these buses throughout the day!” the post said. The state Senate passed the bill just moments after President Barack Obama finished a rally in Denver where he continued his push for Congress to pass a bill requiring background checks for every gun owner. Next week, the president will travel to Hartford to continue his call for stricter gun control laws as the Senate prepares to take up the bill.